Mainland Chinese actress Tiffany Tang (唐嫣) recently attended a press conference for her upcoming TV drama, Agent X < X女特工>. During the conference, reporters barraged her with questions about her high-profile breakup with Taiwanese actor Roy Chiu (邱澤), but she refused to respond. When asked if she was willing to still be friends with him, Tiffany’s sole comment was that she “makes friends only with honest people,” suggesting that Roy had been deceitful. 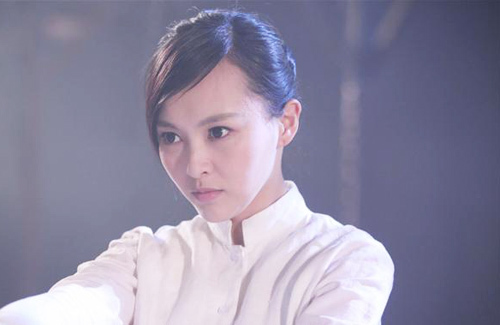 Hailed as the Chinese version of Charlie’s Angels, Agent X is mainland China’s first drama about female secret service agents. In order to adhere to the espionage theme, the four cast members — Tiffany, actor Luo Jin (羅晉), and actresses Zhang Xilin (張唏臨) and Wendy Wang (王笛) — were dressed like their characters at the press conference. They also played a game where they had to assemble a sniping rifle. Gezzzzzz….! Her love life has nothing to do with you. Leave her alone! Besides, rRoy Qiu is a liar. I’m surprised that she responded, but not surprised with the answer she gave. This is Tang Yan’s style. She is very honest with her feelings. yes good for tiffany. she’s also classy in her own way unlike roy and his manager who keep talking non stop on weibo and did one sided declaration after the assistant blew the matter. roy’s responses seem sneaky. I figured as much from the way her “assistant” kept leaking personal details to the public. But she’s still young and will bounce back, I’m sure.